11. Back On Track With 5 Easy Ways To Make Money On eBay! It has been a fair while since I posted. Much water has crossed the bridge since last I posted. There have been valid reasons I have not been listing. However, I am back on track now! I would like to share with you 5 Easy Ways To Make Money On eBay! Well, I suppose the answer to this question really revolves around how you define the term easy. It is my belief that there is no easier way to make money on the Internet than by selling items through eBay. What could be simpler, a straight forward 5 step process. But I suspect what people are really asking is how can I easily get products to sell. From my experience this is what both newcomers and some experienced eBayers find difficult. So in this article I just want to highlight 5 very simple ways that you can get products to sell without even leaving your computer. This I hope that will be easy enough for everyone. It is my belief that there is hardly an item listed on eBay or any of the other online auctions that does not benefit from having a photograph or image included in the listing. In fact most items that are listed without a photograph that actually sell tend to fetch 20% less than those with. In some categories the figures are even higher. For instance clothing items offered without a photograph average a 78% lower selling price than those with. So it would seem to be pretty easy to browse eBay looking for these “photo less” items, buying them and then relisting with a photograph. Money for old rope really. In any book about eBay you will find tips on when is the best time for auctions to finish. The most suggested times for most items are Sunday afternoon and evenings and Wednesday evenings. Some experts suggest that for business related items Monday or Tuesday during office hours are best. If you accept that there are times when you will get increased bids for your items there must also be times when if your auction ends you will not do so well. I would think if you have an auction that finishes between say 5 am and 8 am on a Monday morning you will not have too many people lurking to place last minute bids to push the price up. Again buy and relist with your auction set to finish at a more sociable time and you could easily make a 20% or more profit for very little effort. One of the easiest ways to make money on eBay is to cash in on other peoples laziness. If someone has say a collection of 10 china dogs, it is a fact that if they put all ten in one listing as a collection they will get less than if they had listed each item separately. But it is amazing how many sellers cannot be bothered to do this. I have in the past bought such a collection and actually made more from one of the items than I had paid for the whole collection. Over 95% of all online auction sales are on eBay. They have the largest number of registered buyers and items listed for sale. For this reason items offered for sale on eBay get the best prices. So why not search around some of the smaller online auctions, because in many cases items listed with them will not attract such a good prices as could be achieved on eBay. Then all you have to do is buy from them and relist on eBay. 8. A New Life! A Teaching/Learning World! Hi. I thought I would continue on from where we left off a few days ago. I had been part of a learning world up until I entered Alexander Mackie Teachers’ College Paddington, Sydney NSW Australia, straight after leaving Sydney Girls Selective High School Moore Park, Sydney NSW Australia when I was around 18. During those years I had had the opportunity to learn so many wonderful things in so many areas. I had also had the opportunity of teaching myself things as well – Tennis, the Recorder, and now, during Teachers’ College, the Piano. I also had the opportunity to teach others during my High School life and was to in Teachers’ College also. Without really knowing it at the time, I had truly found my Niche, so to speak. I remember having to fill in some information in Year 5 about what I wanted to be when I left School, and even at this age, I wrote down I wanted to be a School Teacher and also that I wanted to have the chance to share my love of Music and Tennis with others, which I was ultimately able to do in the future big time. Alexander Mackie Teachers College was nearing the end of its days in operation as a Teachers’ College around the time I entered it. I did not realise this. It had previously been Sydney Technical High School. It is almost next door to the Army Barracks and the Tank Stream. During my 6 years at Sydney Girls’ High School at Moore Park, Sydney NSW, I was part of the first group of High School children to see through 6 years of High School instead of 5. When I entered Alexander Mackie Teachers’ College, I was part of the last group of 2 year trained teachers to do so. I was to meet my wonderful, soulmate and husband-to-be, Bruce, through a friend I knew at Teachers’ College, this being during the latter part of my 2nd year of Teachers’ College. We were to marry towards the end of my 1st year of teaching, around 10 months later, in 1970. We have now been happily married for 38 years. We are definitely soul mates and he is a truly great “bloke”. I remember, during my College years, studying 14 different subject areas, and having to complete assignments and exams for all. Our College day commenced at 9am and finished around 5pm, and this was 5 days a week. I also recollect us all wanting to have the opportunity to complete our 3rd year whilst at the College, but this, we were told, was being introduced for the next year’s group of student teachers, not ours and that we had just missed out. Our year, and those who went before us, were to have to complete our 3rd year part-time during night times and weekends, after teaching during the day time. We also had to all do the same again when required teaching qualifications were once again changed from 3 year to 4 year trained. I also remember training to be a Primary School Teacher of Students from Years 3 to Year 6. However, I was to end up being posted to an Infant’s School for my first teaching school, as our College Registrar, in charge of teaching placements, accidentally placed most Infants’ Trained teachers in Primary, and most Primary in Infant’s. This was not a good time for most of us, at all. It was to be 7 years before I could finally move in to teach in the Primary School, where I truly found where I belonged and absolutely wanted to be. I loved the opportunity to teach all grades, which I did get to do during my 29 year career, but my favourite grades were to become Years 5 and 6. My teaching years were truly fabulous and extremely rewarding. I will always be extremely grateful for the opportunity given to me to teach children. It is an unbelievable feeling to know you have had a part to play in assisting the learning of children, and that you can see they have grown from having been in your tutelage. I took my career extremely seriously. I worked very, very hard and loved every moment. I was fortunate to have been given some gifts/ talents, I was able to share with many children. My Music afforded me the opportunity to conduct School, District and Regional Choirs and Choral groups, Dance Groups, Recorder Groups, Bands and Orchestras. I was fortunate to be able to teach every band instrument to the children in my band, as well as conduct them. I was also totally thrilled to have been selected as 1 of 10 teachers from the Region to implement the Kodaly Music Program from Hungary, throughout our School, as 9 other teachers did in their Schools – both through the Infants and the Primary Schools. This was when I was fortunate enough to be able to finally move in to the Primary School. I had spent 3 years with my current class up to this stage, and their Musical abilities, because of the Kodaly Music program, were outstanding. I was given the opportunity to move with them in to the Primary School to carry this program on. Sadly, the program was to fold after several years, because it really required qualified Music trained teachers to implement it. These students were quite brilliant at Music. They could sing in Canon, parts, play instruments to a very high level indeed. It was whilst working with this program I was offered the opportunity to go to Hungary to give demonstration lessons on what I had taught to students with the Pilot program. I wanted to stay to work with the children in my classes here. I also had learned in the Infants School how to really teach children how to Read. Whilst in the Infants, I was also part of another Pilot program that had only been introduced in to our School in Australia. This was so I could introduce the Open Court Language Arts Program from America to my students. This was the same group of Students who were part of the Kodaly Music Program. They were to be tested at the end of Year 2 and their Reading results were up there topping the State. When I moved in to the Primary School at the same school, (because back in those days most Primary Schools and Infants Schools ran separated Departments and their Staff did not have the same Staff Room), I was to carry this program on. Back at that time, Reading was not taught in the same manner in the Primary School, as in the Infants School. I was able to move this program in to the Primary School and Reading results throughout the school improved dramatically. I was also offered a position over in America to work with American students on this brilliant program, but, once again I chose to stay with my students here. I spent 7 years in the Infants Department at this School and 4 years in the Primary School. Whilst in the Primary School I also started to teach choir groups for Opera House performances. This is where children from all over the State of NSW who are interested in, and good at, Singing, join a specific choir to learn more difficult part material so they can all eventually perform as 1 big united State choir at the Opera House. I was to have the privilege to take several groups over the years and it was most rewarding for the children, and also for me. I finally left this school and ended up in a very small country school with 1 class per grade. I was to teach there for 4 years, and was to teach Infants classes, except for 1 year. In all the following schools I was to teach at, as well as teaching my classes full time, I was to also teach recorder, recorder groups, choirs, dance groups, choral groups, band and orchestra, and school musicals, as well as conduct. I was to also conduct and organise District Music Festivals and Regional Musica Viva concerts. It was during this time I was selected as the Regional Music Consultant, a position I had always wanted to have, but, at around the same time, I found I was expecting our first child, and, after much consideration decided I would not have been able to be a “constant” for the Region, so I sadly turned the opportunity for this wonderful position down. They were grateful I had been honest with them. However, my husband Bruce and I were over the moon to be having our 1st child. This was to be a boy and we named him Christopher John. I was also to have a girl, Caroline Elizabeth, around 2 years later, whilst in what was to be my last year at this school. Before I left, this school was to hold its Centenary, which was extremely exciting, with a lot of hard work needing to be put in by the whole school community to ensure its success. The school, however, was to close a year later as a new, larger school, Samuel Terry, was opening up a short way up the road to cater for the large, growing student numbers in the area. This new school was the School to which I was to return after my 12 months I took off to be home with my daughter Caroline, during her 1st year of life. I had also previously had 12 months off to be home with our son Christopher too. This was also a very sad time, whilst off teaching to look after my daughter Caroline, as my father had contracted lung cancer about 1 1/2 years before Caroline was born and, sadly, after being extremely ill over these 2 years, he was to pass away when Caroline was only 8 months old. When I returned to teaching to teach at the New School, the School held a School Opening, as it was in its 1st year of operation. This was another major event, that took much organisation. When you are the Music person in a School there are many extra-curricular activities you are the organiser and trainer of. Another sad event was to happen in the 1st year of this School being open, and occurring around the time Dad passed away, in fact within approximately a month, the 1st School Captain of this New School, a truly great child I was teaching, was to be knocked off his bike and killed. It was a very hard time for his family, and for us all. Whilst at this school, I continued my Choir, Choral work, Recorder, Dance Group etc. It was whilst at this school I was to get my 2nd promotion. I was to then leave this school to take up my role as Executive Teacher at the next School. I had now experienced a large school, 1/2 my career teaching in the Infants and 1/2 in the Primary School, teaching in a small country school, a Bicentennial and Closing of a School, the Opening of a School and now I was to experience another “different” thing. I was promoted to a Primary School. The Infants School, part of the whole school, was, however, positioned on a totally different block of land several streets away. We still needed to work together, so there were many lunch times needed to go to interact with the Staff and Assistant Principal in order to be working on the same plain. My experience with learning to teach Reading was to really become valuable here. I was able to have the Principal purchase many thousands of dollars of well-needed Reading Resources for the Primary School. During my time at this school, as well as continuing with the Dance Group, Choirs, coaching Tennis etc, I was to lead the School Band. There were many band instruments at this School, however, they were extremely old. Undeterred, I was to train each band instrument, and compile and write some Music for this Band – the School Song – Advance Australia Fair – writing the parts for each instrument. In their 2nd year of me working with them, from most of them never having played a band instrument before, the Band performed these pieces of Music, as well as other Music, to the delight of the parents, and the children themselves. I certainly did experience a number of unusual events during my teaching career that most teachers would not have the opportunity of experiencing. They were rewarding as experience is the greatest teacher. Another was to come to pass at this school. The Education Department decided to utilise the classrooms and block of land where the Infants’ teachers had been for many years, as a District Headquarters, therefore requiring the Infants’ teachers and students to move up to merge with us, after having been separated from the Primary for many, many years. There were a few teething problems, but we overcame them. It was also during this time that the High School next door to our Primary School, on the same block of land, and the School to which our Primary School children had mostly automatically gone to forever as their local High School, was chosen to be a Selective High School. This meant that most of the students that had been automatically going there forever would have to travel to High Schools further away. This was a very difficult time for the Parents to come to terms with the fact their children would now mostly have to travel. I already had a very deep interest in Teaching Children to Read, but I also had a blossoming interest in teaching Gifted and Talented students. I was working several programs, with the children at this school to extend them, as there were a number of students at this school who were moving ahead extremely quickly with their schooling and learning, in a wide variety of subject areas. I went on to devise a successful program that was to ultimately see quite a number of students leave our School and enter the Selective High School. Our son Christopher was to sit for the Opportunity Class and was to achieve extremely high results. He was to move to the Opportunity Class, at another school, for Year 5 but I was fortunate enough to be given the opportunity to teach Year 5 at this school and my son was to be in this class. People often asked how that was. Christopher loved it. The rest of the class didn’t mind it at all and saw no favouritism was ever shown to him, testament to the fact he went on to be chosen as Vice Captain of the School for the next year. I had now been the Acting Assistant Principal at this school for 18 months. I was to get an opportunity to move to the School as an Executive teacher, where the Opportunity Class was situated, which is next door the University. An Executive Teacher not only teaches in the Classroom but holds leadership, management and Executive roles within the school. Christopher, Caroline and I were to now move to this School. Christopher was to take up his place in the Opportunity Class for Year 6. His Maths was so advanced he was riding to the local High School 5 days a week to work on Year 10 Advanced Maths. I was teaching the classes with hard to manage children, many of whom were behind in their learning. Many of these children went on to improve their results dramatically, which greatly boosted their self esteem and behaviour. But I also had the added opportunity of being able to work with the Gifted and Talented children. I was to teach the Opportunity Class for Maths for 2 years. These children worked the Maths Olympiad to come 2nd in Australia and the Tournament of the Minds to come 2nd in NSW, losing by only 1 mark to the School that went on to win the Australian Tournament. Christopher and Caroline were part of these groups. Caroline was to become Prefect in Year 6 and also came 2nd in the entire School of 5 Year 6 classes during this year, including the Opportunity Class, which she never sat for entrance for. She was to Dux her own Year 6 Class, which I was fortunate enough to get the opportunity to teach. The class was actually a Year 4, 5 and 6 composite. Once again the same applied for Caroline as Chris – no favouritism etc. I can honestly say it has been most rewarding to have had the opportunity to teach my own children at School and they still say they were the best years of their school life. I was involved in many School curriculum areas, during my career, many at the same time and also heading many, but still continuing with my Band, Choir, Choral Group, Dance work in the School, Region and State at all schools I taught at. It was whilst at this last School, I was to organise 2 School Musicals that entailed working with the whole school, parents, teachers and students alike as one big team. We all pitched in together to hold 2 really great Musicals. There was much work to these, with organising the venue, the costumes, the performers, the training, etc, but they were truly memorable experiences. There were many, many other areas I participated in, and/ or led during my years of teaching. We were also able to participate as teachers in much Staff Development, Personal Growth work, and Curriculum training etc. One of my favourite learning experiences was the Accelerative Learning for which I was to become Accredited and earn my 4th Year Status. It was at this time also that everything seemed to be going along smoothly. It was in the previous year I had had the opportunity of teaching Caroline. It was during this year also, and whilst on an excursion o the University next door with the Senior School students, of which I was the head teacher, and, also once again the Acting Assistant Principal, that I was to have the freak accident that was to eventually take away my career. After the accident, I was now teaching a Year 4 and gradually getting more and more unwell. I was also heading the 2nd School Musical. However, not long after Princess Diana died, I was no longer able to return to school full time. It was to be several months before I finally got to see a Specialist who immediately, almost 12 months after the accident, understood what had happened and what needed to be done to help me. I was only able to make the last couple of weeks of school that year to see the Musical to its completion. I was so certain I would be back on my feet after the next School Christmas holidays in order to be able to continue my wonderful career. I had also just before these Christmas Holidays, been given the amazing news by the School Principal that I was to be the next year’s Opportunity Class Teacher. This was out-of-this-world news, something I had totally dreamed of my whole teaching career, but, sadly, after many attempts the next year, I was never able to return to school teaching again. I was to be medically discharged 2 years later. One could look back and see how truly sad this was, and, at times, I did, but more and more I have come to realise over all my years that one door closes and another one opens, as long as you let it. I was to spend much of the next 6 years in hospital, more in than out. I had a very different, extremely difficult form of treatment that was required for my “condition” and really all was a huge life battle. It was a 1 step forwards and 2 or more steps backwards experience, but we never gave up. If I ever wrote a book about this period of time in my life and the effect it had on my husband, mother and children, people would not believe it. I prefer not to go there as it was too painful and I feel it is very important to have grown from there. I was to meet many people during this time who had a great impact on my life then and also its future, my survival, etc. It was truly a growing time. It was, many times, a fight for survival, but we came through. I think I have sort of caught you up to where, why and how I was introduced to Network Marketing and MLM as I spoke of in my previous Blog sessions. That’s enough about me now though, and I will now be focusing on where I am going today and in the future – why I love eBay and what John Thornhill and Daniel Sumner are teaching me, as well as Matt and Amanda Clarkson. Thanks for listening and have a great rest of the day! Speak with you again soon! 32. eBay As An Option For Buying & Selling! I have not posted for a very long time. I have been spending time building my eBay business! I have actually built 4 IDs on eBay using a Dropshipping method. I am very happy with, & proud about, how my eBay business is going. I have achieved Top Seller status in all 4 IDs and have, to date, with 100% feedback scores in all 4 IDs, of which I am very proud indeed. so to have built 4 IDs using this method makes me quite proud indeed! & which makes me even prouder of our feedback scores and Top Seller status. To successfully Dropship one needs to find suppliers one can trust with their life, so to speak, and I have found the very best out there. We have had over 5000 valued customers purchase from us over our 4 IDs with a + feedback score of over 2779 in all so far to date. I am focussing my time on working eBay and BVD of which I will be talking a great deal more about in the future. Here are my links to look around/ maybe purchase? I hope you enjoy visiting these stores/links etc and find items you like? I will be back to discuss more about buying and selling on eBay and BVD. to be much more rewarding & for the returns to come back so much faster. Thanks heaps for stopping by and taking the time to read my Blog. As you know I have been mostly absent due to illness. because of my health issues. great that I believe will benefit you. and/ or the written word. to read about, and invest in, this excellent program. Well. That’s all for today! Thanks so much for stopping by and taking the time to read this post. 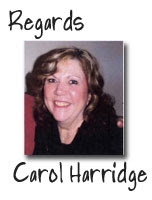 It is Carol Harridge here. Not too long ago I disappeared off the radar due to health issues, which arose again. but, unfortunately a few hiccups/ seemingly volcanoes occurred. to commence again, but a few more unexpected were to come my way. I have just been through a further few weeks of those curve balls. Health is truly a very important thing, as I said before. I really am feeling much better, but am taking one day at a time. time I do apologise and hope to rectify that asap. and I will do all in my power to see that I can assist you. etc, which is improving more and more every day now. be in the fields of Internet Marketing, eBay and Making Money Online. I really do look forward to working with you in the future. I am really enjoying writing articles and submitting them. Here is the article and I hope it is helpful. Please leave your comments and if there is anything else I can write about for you please let me know. There are actually 2 main types of business methods online Internet entrepreneurs utilize in order to generate income from blogging. • The 1st way is the most common way one can turn their blog in to a profit-making money machine and that is by selling advertising to various businesses and trade names/ brands for those who desire to reach a particular blog’s readers. • The 2nd kind of profit-making blog is the kind that assists a single brand name better its overall image by establishing extremely strong connections between the blog itself and the product that is being displayed there, in the mind of their potential customers. Both of the above types of blogs have the potential for resulting in generating a great deal of money in profits, particularly if the original developer of the product has a razor sharp mind for promoting their product, advertising and marketing it. • You can carry out all the work yourself, and, in turn, hang on to all of the profits for yourself. With the first choice mentioned above, a great number of people actually make money on their blogs by selling space via Google’s AdSense program. My blog uses this technique. The advantages this technique provides for one is many, as only a small amount of input is required by the blogger to start pulling in profits. However, on the other side of the coin, a great number of people find out that they don’t make that great an amount of money using this method as they had hoped their blog would provide to them. If you choose to sell advertising straight to the businesses that desire to put their banner ads and/ or sponsored links on your blog site, then this method can actually take quite an amount of time to establish, but it is frequently quite profitable indeed. This would be a great method you may want to use also if you have a If you have a large number of contacts you already know that are part of specific industries related to your blog’s main topic/ niche/ theme. You are more than likely one step ahead if you already have a very sound background experience in sales, and are skilled at pitching sales offers, as this method will be a great one for you, one where you can generate quite a lot of money leasing blog space at your blog site to these interested businesses. On the other side of the coin though, by far the major setback with this method is that you frequently must develop quite a large blog following of readers first before you are able to catch the attention of many of these advertisers, resulting in this method maybe taking you quite a number of month’s background work to achieve prior to you commencing to make profits from your blog. well-known, firmly established businesses are working out how they too can become part of this craze/ action. One of the clever ways businesses are taking advantage of this blog craze is by establishing blogs that offer a type of friendly overall look for their business. Frequently, a corporation will hire an experienced blogger to produce a blog that is expressly created to attract, and interest, that type of business’s customers and also to nurture positive connections with the company’s brand in the customer’s minds. It would not be the first experienced author who has often, over time, dreamed of making money via blogging that has ultimately been contacted by a business with the express purpose of offering them quite a sizable amount of money for this type of appointment. Which one of the methods do you prefer? Do you like them both? Which method(s) will you use? Good luck with profiting from your blog. Thanks for stopping by. I thought I would like to share some more information with you about Opt-In lists. This information is taken from another of my copyrighted articles. It is very possible indeed to easily convert every single visitor who visits your blog/ squeeze page etc in to becoming an extremely loyal subscriber to your Opt-In List, and who stay with you because they come to know, like and trust you. In the case of people who visit your website/ blog etc., but who ultimately don’t remain too long, but, instead, actually leave, then it is highly likely they will not return again unless there are very convincing reasons indeed to be found at your site, and by staying with you, for them to do so. It is usually a fact that the majority of us act quite spontaneously when using the Internet and working online, and the reality of this being that the resulting consequences of this natural sort of action is that it is highly likely that most of us quite easily not remember what we were initially looking at, nor where we have visited, as many as ten web pages before. However, the real outcome of this is that this visitor/ these visitors to your site may not ever return to your blog/ squeeze page/ website ever again. So let’s look at this more closely by using an example of possible visitor numbers. Let’s say around one thousand visitors pay a visit to your website etc, only to depart reasonably quickly and never return. Just envisage the sum total of your possible profits that have now disappeared completely, merely because they just don’t return to you. Imagine the profit returns if you had at least been able to convince a small number of those visitors into becoming your customers and joining your opt-in list. Quite a number of people state that it is in the creation of unique content that keeps a number of the visitors returning and, it is true that content definitely is important, especially when it is unique. However, quite frequently unique content on its own is not the complete answer, by far. The genuine, true, long-term answer really entails converting your visitors into loyal, long-standing subscribers of your opt-in mailing list. Prior to your visitor leaving your website/ blog/ squeeze page etc, you really need to convert them in to becoming a subscriber by way of them simply being able to opt-in to your mailing list. The method you use for doing this is by simply asking for your visitor’s name and email address via the use of a simple opt-in form. This means that when your visitor fills in their name and email address they will now be signed up to your opt-in mailing list, and you will be able to follow up with these subscribers via emails, which can be individually sent, which is very time-consuming, but also holds an important place in communicating with your subscribers, but, also, instead, via joining, and using, for a minimal monthly fee, a very good autoresponder company, which then results in you being able to automate your emails to your subscribers. Now that your visitors have filled in their name and email address and opted in to your mailing list this will give you the opportunity of your subscriber now considering your offer further, or, over time, as they begin to know, like and trust you more, you may be able to present further offers to them. It cannot be understated how important it is to convert as many visitors to your sites/ offers into your subscribers as possible in order to achieve the loyal opt-in subscribers who come to know, like and trust you, and for you also to be able to eventually earn the prospective profits you will rightly then earn, but, instead, this being via the simple, prudent and trusted way. Visit other’s blogs/ websites etc and see what methods they are using and emulate the success of others. I would love your feedback and comments please as to whether/ how this is beneficial information for you and if there is anything I can provide to you that you may be searching for. Thanks so much for dropping by and I look forward to your comments, recommendations etc. Today I am going to share another of my Articles that I submitted to Article Directories. It concentrates on building a successful optin list. I hope you enjoy the information I am sharing and do appreciate any feedback you may have for me. We Have All Heard That The Money is in the List Haven’t We? Have You Got One? Well! It Definitely Is Important For You To Build Your List As Soon As Possible For Today And Tomorrow! Let me share with you the very best, most successful, fastest ways to do this. Let’s put a scenario forward that depicts you as being at a place where you have finally come to appreciate the importance that you really do need to have a good quality list that has opted in to you. You now feel you have read numerous articles and information about the importance of having a good quality list, attended coaching programs related to the topic, as well as seminars etc and also questioned a number of experts for their advice on this topic. You have also read a vast number of success stories that related to people who were now earning a huge amount of money from their own opt-in lists. All of a sudden you find you are in a place where you believe you now know all there is to know about opt-in lists, and about how to create them etc., having followed all the learnings you have partaken in right down to the last letter, you feel, but you have found you are still not making any money worth writing home about, and with definitely no profits showing for all these efforts. In reality, there is a possibility you might even have lost money at this point. You may have even decided to outsource to get some writers to assist you, but this has resulted in extra costs to pay them. You may have even built a reasonably large list this way but find that only a small amount of people are actually buying from you, which has definitely resulted in loss of profits. You may not even come to this realisation until a few months down the track when you work out your profits and losses for this time. You begin to wonder what went wrong? You may start to question as to why so many others have been successful at this when you feel you have “failed”. Usually the most frequent mistake people make is that they jump right in too fast. They haven’t researched their chosen topic enough to find out if it is a popular one to share with their list that is what their list is looking for, and that they could actually make money from this topic/ product if they shared it with their list. Just because we send out to our lists, does not mean that people are actually going to buy from us. • It is important to not start sending out to your lists with products for them to buy from you. You really need to get your list to know, like and trust you first. They have only just joined your list and they do not yet see you as an expert, nor someone they can trust purchasing from quite yet. It is time now to send out many free articles etc to them, as well as information to them that you really know something about. It is also time to share some of yourself with them, so they get to see you as human, approachable, a person. Also visit Forums related to your niche so you can gain first-hand knowledge of what people are currently looking for – what their needs and wants are, and then you will be able to target these in the correct way. • Not only should you visit Forums to see what people really want and need but you should also join Forums related to your niche as well. This is your opportunity to provide support, knowledge, expertise, advice and information to people you are ahead of with knowledge, in order to help them genuinely, of course, but also to build up their trust, and when you have accomplished this you definitely will be able to start building your very own opt-in list. You will also, at the same time, be building trust with other Forum members, and building friendships, as well as future business partnerships. You can also ask them to join your list, and you theirs. It is quite a true thing that friends almost always are very good customers. Also, share with your customers/ those on the Forums a link to your site – your Blog? so they can get to find out more about you and what your business is all about. The absolute truth is that money will not flow towards you until your customers and subscribers know, like and trust you. They are looking for products or services that are a very good exchange, in their eyes, for the parting of their very hard-earned cash. They really aren’t going to purchase items from you, as a result of your advice, when they really don’t know you, nor whether they like or trust you at this stage. • It is extremely important to search out, and uncover, a product or service people really want and need to purchase from you. When you have researched thoroughly to find what they really do want and need, even though this actual niche may not be an area you feel you are particularly strong in, it is important to push forwards and use this information to produce something you now know they actually do want and need. Just devote the essential time, effort , research and learning in to a finding, and producing, a product or service that you are actually able to sell as easily to your customers or subscribers that equally provides this same opt-in list, simultaneously, with products and services they will now definitely be able to utilise. Whilst it is certainly a fact that it is better to sell products and services you have expertise and/ or an interest in, maybe not many people will have the same interests as you, and you therefore may be selling something to your customers that is not going to be beneficial at all to them, nor profitable to you. When you actually do take the necessary time to research something they want and need thoroughly enough you will actually, in the process, become more knowledgeable in that area and you will definitely see profits result for your efforts. The power of word-of-mouth advertising cannot be underestimated either, so the building of these genuine relationships based on knowing, liking and trusting, that take time to establish, and when achieved it I also important to provide your customer/ subscribers with advertising material as well that they can share with others so they can help spread the message virally about your product or service. • It cannot be underestimated the importance of forming strong friendships with your opt-in list of purchasers / subscribers. There is an incredible amount of articles/ products/ services/ reports available out there on the internet, but there is no substitute for obtaining information as to what products and services are the best out there to procure, than from someone you know, like and trust and that is where you come in having built that firm relationship with them that is based around these 3 important areas. • Also, it is important as you may be fortunate enough to have people opt-in to your list who have already established their own successful opt-in list, as you will be able to form a strong, business partnership with them as well. Experience is definitely the greatest teacher and these experienced opt-in list builders will be able to relate to you things to do and things that might be better not to do as they have already experienced the successful steps and the pitfalls themselves. Even though situations can be quite dissimilar for different people and circumstances, the overall learning curves they have been through can still be extremely beneficial to cut your journey shorter. There really are quite a lot of things you should steer clear of and these experienced people on your opt-in list will be able to help you avoid them. To build a successful and profitable opt-in list is definitely not an overnight event. There are lot of things to prepare, and much effort to apply. Everyone’s opt-in list starts from zilch, even the “gurus”. As your opt-in list grows, and it will if you follow the essential steps to do so, it is vitally important to preserve the quality of your opt-in list. You should keep it ordered and manageable. If you need to outsource and get assistance in some areas, then it is important that you do so. The most important thing is to ensure your customers/ subscribers are pleased and happy with the service you are providing, that they know, like and trust you, and they will then definitely be eager to purchase from you. Good luck with your successful opt-in list building! I have established my own opt-in list, that continues to grow. To discover more list building secrets visit http://www.Internet-MarketingBootcamp.com. I hope this information has been helpful to you and I really do look forward to feedback, questions, recommendations etc. I have had a number of things occur that have limited my time to be able to get back to Blogging for quite a few weeks. My blog content concentrates on Internet Marketing, marketing online, the power of auctions and eBay, family, friends, topics of interest, product reviews, recommended products, making money online etc. I have been writing quite a few articles over the last few weeks. I am happily going to share those articles with the people who have opted in to my list as well as to you who have kindly visited my Blog. I love writing. It was something, for many years, I did not feel I was capable of doing. However, in teaching children, and reviewing their work etc, I realised I was able to write and so started to put pen to paper. I love writing/ typing my Blog and also writing Articles, Reports etc as well as creating Sales Pages. I thought I would share with you some information I wrote about eBay a few weeks ago. I submitted to various Article Submission Services and am very proud to have received my “Expert EZine Articles Author” Logo you can see over to the right on this blog, under the calendar. I am also extremely proud of the fact I took Rich Schefren’s advice and visited http://onlineidcalculator.com with the result of being determined as having a Digitally Distinct online presence. That logo is also over to the side under the Ezine one. Here is my copyrighted article I submitted regarding eBay. You can certainly make a lot of money selling your own no longer wanted or needed possessions, and all you need to know is how to successfully sell at auction sites, especially on eBay. eBay is probably the most popular online auction site by far, as many millions of transactions, of a buying and selling nature, occur there each and every single day. Today I am going to share with you 10 hot tips that will assist you when selling your unwanted/ no longer needed possessions on eBay, or for that matter, any auction site. 1. The 1st step is that it is important to have opened an eBay buying and selling account. They are both free to set up. 2. Always write a very descriptive Title for your item, to ensure your item appears more frequently in the search results so potential buyers will be able to find it more easily. 3. Always take your own photos of your items. People are much more inclined to purchase items that have a real picture of the item clearly displayed. 4. Make your Description of your Item very clear and concise. Ensure it is well spelt. Use phrases that are easy for people to understand. Keep it friendly. 5. If you do not want your item to sell below a particular price, then it would be a very good idea to set a reserve price for it. 6. If you are happy to sell your item for a specific amount, then it is advisable to use the ‘Buy It Now’ option. 7. Continue to find, and read, of other tips on how you can successfully sell on eBay. 8. It is very important to log in to your eBay account and frequently check your emails. People may have questions about your items and it is important to answer these as quickly as possible. 9. Always take time to watch your items that you are selling to see how they are going. 10. Make sure you post your item quickly once it has sold. This will ensure you get good feedback registered from your buyer. This all might give you the impression that is rather difficult to become skilled at selling profitably on eBay. However, in fact it is really rather easy. All it takes is a small amount of persistence to be profitably selling items on eBay relatively quickly. If you want to follow a step-by-step, proven online eBay system to make good money quickly and easily, that you can setup and commence today. I hope this information has been helpful and I do appreciate your comments, requests, and recommendations. I have had a very exciting week. John Thornhill, Internet Marketer extraordinaire, Mastery Coaching Mentor, and eBay PowerSeller, along with other Affiliates, officially launched my Product Auction Strategies Explained over this last week. I am so honoured John felt my product was of such a high quality that he would go JV with me. It was an exciting time and I thank them all very much. There are other JVs who will be assisting in the next couple of weeks and more Affiliates are coming on board, as we speak. The product is doing extremely well. I was blown away. The product commenced at the bottom of ClickBank, and on the first day of launch rose to Number 14 and the 2nd day was at Number 9. 1 week later it is still at Number 10. Wow! I am so excited. Affiliates and JVs have earned really good commissions to date, so a great opportunity to continue to promote it exists as it is a product that will be as relevant in the future as it is today, and, so therefore a great oppportunity to earn extra money. There are heaps of ideas for promoting it in the Affiliate’s section at http://AuctionStrategiesExplained.com/Affiliates-Page.html. I have had heaps of great feedback, which I truly appreciate. It was a product I created because I wanted people to see how quickly and easily they could commence earning money selling on eBay. eBay is a powerful way for people to earn money almost immediately. There are many ways discussed in the eBook as to what to sell. The eBook itself is also a Roadmap to getting started selling. I genuinely used what I described in the eBook to start and earn $400, $500, $600 a week. I was merely selling things from around the home. I still have much from around home to sell. Other methods of what to sell, and how, are also discussed. I will share with you the honest truth of how this eBook came in to being. I created the Sales Page, and all the other pages you view when going to the site. I have created the mini course and the brandable report that can also earn Affiliates income. I was a Relieving Assistant Principal in a Primary School, in a teaching career I absolutely loved. I had a wide variety of curriculum areas I was involved in/ leading within the school, district, region and state. I sadly had a freak accident at school that took away my career and hospitalised me for the majority of 6 years. I was an extremely ill person, in chronic pain, requiring specialist medical assistance and treatment, and almost lost my life on several occasions. I also had several overdoses of my essential drugs given to me, 3 major surgeries, 44 anaesthetics, countless canulas, portacaths, 3 major blood infections and so on. It was a struggle for survival but I never gave up. My husband battled on in those years to help bring up our teenage children and we also had my Mum living with us who developed Alzheimer’s after a few years. To say life was not a battle would be an understatement. We had lost our 2nd totally needed income overnight. There were medical bills, legal bills, children’s need’s bills, teenage and education costs, Mum’s costs etc etc. We also had a mortgage. We managed for the first few years financially but time passed and so did our ability to cope financially. The mortgage was getting larger and I was not getting any better. I felt deeply for my family and what they were going through because of all of this. I started to look for avenues to make an income online, on my good days/times to assist if I could as I knew I was a conscientious, hard-worker, self-motivated etc. At first I became involved in Network Marketing, eventually becoming a Silver Director in one company, followed by almost 20K in another company. I will not go deeply in to the story except to say I found I was able to work Network Marketing very well and to this day the majority of people I recruited and trained and supported are still my friends. I eventually realised this was not for everyone and decided to leave. It was all much deeper than this and there were lots of reasons why I did, but I will not go in to those. I, knowing how I loved the computer, and being reasonably savvy with it, decided Internet Marketing was something I would like to try. I was so green, and little did I know that I was to be taken on a very expensive ride. I was so disillusioned and thousands of dollars we really did not have were expended to end up going nowhere. I suppose I could have given up and said it didn’t work and there were a lot of cheats and shonksters out there just wanting to take your money and then fly the coop with no support etc. But, I have never been a giver upper, and fought through those years I was ill in hospital. Enter John Thornhill, Dave Nicholson, Daniel Sumner, Steve Barrows, Alex Jeffreys, Garry Parkes, Tony Sharpe and Avril Harper. My faith and belief was restored with them. I also joined Avril Harper’s course and Tony Sharpe’s System G (Tony is also my friend). They too have helped me enormously. I would NEVER have been able to launch my product without their assistance, along with Dave Nicholson, Daniel Sumner and Steve Barrows, who just creates the very best graphics, headers imaginable at Planet Divinity. He has designed all of my graphics including the header and footer for this website. He is brilliant. I am also thrilled now to be being part of Alex Jeffrey’s Coaching and also Rich Schefren’s. It was because of my loss of thousands of dollars I really wanted to present a product to people, where if they followed what I did, and I really did do it, they too could earn great money almost immediately selling on eBay, without having to spend the thousands of dollars I did to learn that information. I love Internet Marketing very much too, but there is a journey to learning it and starting to earn some money, so I felt using a similar method to what I had used that I described in the eBook, one could either earn good money for extra cash/ take eBay selling on full time to earn great money/ use it as another stream of income as it is immediate income, or use it to supplement their learning etc of internet marketing, until this took off. I will now always use both as I believe in multiple streams of income. From what I can tell from the majority of investors they feel I have hit the mark and are happy with the product and for that I appreciate it very much as that was my wish, and I thank them very much for investing in me. I took time off from my eBay selling to work on this eBook. It is, I have been told, innovative as it has videos and audios embedded within the actual eBook that launch either automatically or on clicking. There are great free bonuses and also some videos that are a minor extra outlay that harmonise with the product. I am now recommencing selling items from around the home, as I have many to sell, and will continue to use the methods described in the eBook. Opt-In Above To Get FREE The 7 Keys To Online Marketing Success Delivered Directly To Your Inbox…Then Just Copy Me And Do Exactly The Same! Carol Harridge on 19. Marketing With Carol – Working On My FREE 7 Day Course!